Install Django fron it's github repository. We will configure python 3 before we start with the Django installation. On my Ubuntu machine, there are two versions of python available, python2.7 as default python version and python3. In this step, we will change the default python version to python 3. So the default python is 2.7 at the moment. Pip is a package management system for python. Python has a central package repository from which we can download the python package. It's called Python Package Index (PyPI). We set django==1.10 to get a specific version. If you want a different version, just change the number e.g. to django==1.9 etc. Django 1.10 has been installed on the system with pip. Proceed with chapter 3. Virtualenv is a python environment builder, it is used to create isolated python environments. We can choose the version of python that will be installed in the virtualenv environment. This is very useful for developers, they can run and develop an application with different python versions and different environments on one OS. Now we can use the virtualenv command to create a new environment with python3 as default python version. So let's create a new environment "mynewenv" with python3 as the python version and pip3 for the django installation. --python=python3 is a binary file for python 3. The command will create a new directory called 'mynewenv' which contains the directories bin, include and lib. Note: If you want to get out from the virtual environment, use the command 'deactivate'. Pip will be automatically installed in the virtual environment. Django 1.10 has been successfully installed in our virtual environment. Proceed with chapter 3. -e = Install a package in editable mode or a local package. In this chapter, we install Django from the local code that we've cloned. We see the Django 1.11 dev version. The manual Django installation is finished. In this step, we will install Django inside a virtual environment and then start our first project with Django. The runserver option will create an HTTP connection with python on localhost IP and port 8000. If your development environment is on a separate server, as in my example here I'm using an Ubuntu server with I : 192.168.1.9, you can use the server IP so you can access Django from outside of the server. migrate: make adds the models (adding fields, deleting etc.) into the database scheme, the default database is sqlite3. 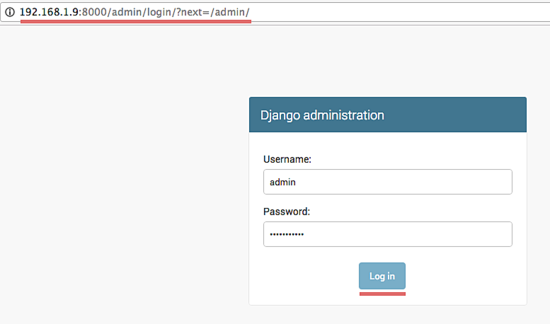 Django has been successfully installed inside a virtual environment and we've created a sample Django project named 'firstdjango'. Is it possible integrate Djago with mySQL? Please dont delete python2 ever. This will screw up your ubuntu. To fix the locale on the latest release of Ubuntu 16.04 I had to type 'export LC_ALL=C'. It did not work with the language spec. Thanks for instructive introduction to django! how do you remove ? update-alternatives --install /usr/bin/python python /usr/bin/python3update-alternatives: --install needs <link> <name> <path> <priority>Use 'update-alternatives --help' for program usage information. Instead of removing ubuntu, add alias python=python3 in .bashrc file and type the same in terminal. Now you will be able to use pyhton3. The step to set python 3.5.2 as the default python needs the 'priority' arg. In case of any error or failure, execute the same command with "sudo". If you follow this article will it not break apt? Apt requires python2-if you default the system to pyhton3 there will be BIG trouble. Is there a way to do this and NOT make python3 the system default? Make it available for apache/django but nothing else on the system. I run Xubuntu 1604 release. To whom it may concern, Thank you for this tutorial. I had been having trouble installing, setting up django on my ubuntu. This tutorial helped sort my problem and that I am now up and running. I look forward to developing a great python web app. Thanks. "update-alternatives --install /usr/bin/python python /usr/bin/python3 1" as shown in the image. what's after this basic things completed? Woot. It worked. After three other tries on other websites' tutorials, yours worked flawlessly. Thanks!